The primary energy consumption of USA is 2.35 Gtoe per year. This is nearly the quarter of the total primary energy consumed in the world. Fossil fuels contribute to 85% of the energy consumption and oil represents a large part of that. Nearly half (49%) of electricity is produced from coal. 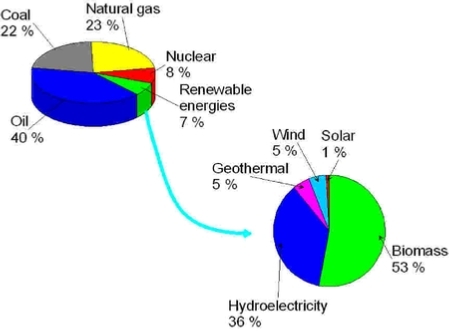 The amount of renewable energies is 7% but, among them, biomass and hydroelectricity represents 89% of the renewable contribution. Other renewable energies are growing fast but their overall contribution to total primary energy consumption of the USA remains small (less than 1%). This is summarized in the figure using data from the DOE.